For writer Billy Jensen, Audible is the obvious choice for telling stories that fall outside the mainstream true crime genre–including his own. "Audio is so personal, so intimate," he told an audience of Audible employees during a March 21 visit to Audible's headquarters in Newark, and then laughed. "I don't need to tell you guys that!" "When we're dealing with such a sensitive topic," such as cold cases, victims and killers, he went on, "having me whisper into your headphones, in your car on your commute, that's almost the way these stories are meant to be told." Jensen was onsite to share his experience creating his Audible Original Chase Darkness with Me with Vanessa Harris, Director of Content Partnerships and Programming, and Audible Editor Kat Johnson. Later the same day he would take the stage at Death Becomes Us, a true crime festival, to discuss his Audible book and DIY detective work with Paul Holes, a former detective and co-author of the Audible Original Evil Has a Name. Go behind the scenes with Billy Jensen. Jensen has dedicated his career to pursuing unsolved murders through every medium available to him—newspaper and magazine articles, books, television programs and even social media—and says he's solved 10 homicides through his investigations, writing and activism. Notably, he helped finish close friend Michelle McNamara's bestselling book, I'll Be Gone in the Dark, about her obsessive attempt to track down the Golden State Killer, who terrorized California in the 1970s and 80s. Soon after the book's release, a suspect was finally arrested and is currently awaiting trial. But there are more than 220,000 unsolved murders in America, Jensen pointed out to the audience at Audible. And those cases "are not going to be solved without civilians," which is why Jensen is using Chase Darkness with Me not only to tell his story and the crimes he's solved but also to share tips on how he's done so. From urging people to go to law enforcement with long-held information or using social media and the internet to research cases, he hopes his Audible book will inspire people to act—within the accurate, ethical and safe guidelines he's laid out for citizen detective work. With the prevalence of DNA information and testing, Jensen believes a lot of the "answers are really out there." And harnessing the burgeoning interest in true crime audioseries, books and television to solve cases is what he describes as the 'True Crime 2.0' era. For his part, he hopes that his Audible Original "is really ushering it in." 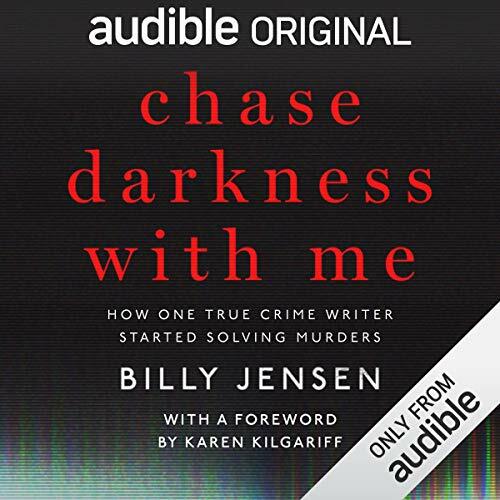 Uproxx: "Billy Jensen On His Must-Listen For True Crime Fanatics, 'Chase Darkness With Me'"
Your Tango: "Who Is Billy Jensen? New Details About The Digital Detective And The New Podcast He's A Part Of"
Oxygen: "Help Billy Jensen Solve His 'White Whale' Case — An Unsolved Murder In Brooklyn"
BuzzFeedAM2DM: "Billy Jensen and Paul Holes Catch Murderers IRL"
Cheddar TV: "Crime Investigators, Paul Holes and Billy Jensen, Join Forces for 'The Murder Squad'"
Fortune: "How True Crime Podcast 'The Murder Squad' Will Crowdsource Investigations"
Dr Oz: "Can You Use Social Media to Solve a Crime?" Inside Edition: "Billy Jensen is Chasing Murderers and Wants You to Join Him"
Audible announced a production deal with Broadway Video to produce audio-only comedy originals. The collaboration kicks off with “Heads Will Roll” created by Kate McKinnon and Emily Lynne.